We at Soundproof Studios are well-known for our outstanding soundproofing products. We help the world’s finest studio designers and sound engineers achieve optimal sound input and sound output conditions. Many of our clients have a preexisting space and hire us to help them optimize the sound isolation of various rooms. Some may not know that our soundproof design consultants can also help plan a space that has yet to be created. In this article, we focus on some of the technical aspects to soundproofing a studio and the sound absorbing materials you’ll need. We recently saw a great clip where Matt Risinger of Risinger Homes and MattRisinger.com interviewed Bill Blaylock, owner of Concept Electronics. The two discussed some of the finer construction details to consider when getting into recording studio soundproofing. “Can you give us any final tips for somebody who’s watching this video?” asked Risinger. “Well, the devil is in the details. Getting every detail just right, 100%, is what makes it all work. The one shortcoming will negate at least half of the effect,” replied Blaylock. We love this sentiment. 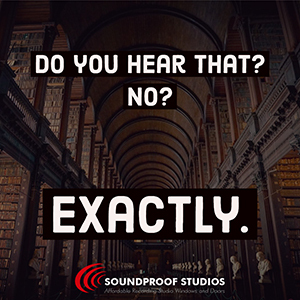 So many studio designers and home designers will apply rigorous research and careful consideration to the walls, ceiling and floor of the soon-to-be soundproof recording studio, but they fail to address important details such as soundproof recording studio doors and recording studio windows. Now that we have this critical point covered, let’s get into the nitty gritty. What Types of Rooms Will a Soundproof Recording Studio Require? “Well, we’re in the control room of a recording studio. Behind us is a vocal room, and behind that is a live room where the musicians will actually play. This is where the engineers will stay. They’ll listen to [and] mix everything together the way it’s supposed to come out at the end of the process. So, it’s really important to hear exactly what’s happening in the other rooms very clearly without interference,” said Blaylock. “And, so, this room is really the most soundproofed in this office, correct? This is the one that has the heavy-duty soundproofing?” asked Risinger. “They’re all treated very similarly. They’re all equally important on getting very pure audio either into the system or out of the system,” said Blaylock. “… First of all, you can see we’ve got our insulation up. What’s the process here?” ask Risinger. “Well, we’ve got two layers. We’ve got two walls. We’ve got an exterior wall that’s sealed with a good foam insulation. We’ve made sure is a good airtight envelope, and then we framed a floating inside wall that’s insulated with a batting insulation and that adds a different type of sound absorption than the foam does, so we get a wider spectrum of effect,” said Blaylock. “Oh, that’s great. And then on top of the standard two-by studs, we’ve got this metal hat channel. Tell me about this process and what this is doing for us,” said Risinger. “Well, the hat channel is a common product. What is unique is the use of the clips that span the studs that give the hat channel and the wall, the drywall, the ability to flex in and out a little bit, and that lets it absorb and dissipate energy,” say Blaylock. “Gotcha. And, so, these are commonly referred to as isolation clips. Is that right?” asked Risinger. “Okay, and then you’ll also notice, I thought this is important to point out that those clips are screwed into the 2×4, but the hat channel is actually snapping into that clip. So, there’s not a mechanical bond between the two. Is that right?” asked Risinger. “Yeah, so, now when our sheetrock gets installed it’s not tied mechanically necessarily to that structure behind. So, then, what’s going on top of the hat channel here, Bill?” asked Risinger. “Well, two layers of 5/8 drywall. The first layer goes up, and then when the second layer is put up, green glue is applied between the two surfaces which is a damping compound which again encourages a little flex, a little bit of energy absorption and dissipation,” said Blaylock. “Gotcha. And, you notice in this room that we’ve got our ceiling on first. So, tell us the process of when you’ve got a room like this. What’s the kind of order of install?” asked Risinger. “Well, we get the wall built. We get it insulated. We get everything sealed up from the corners. And, we put the two layers of drywall up with the green glue in between the two layers on the ceiling. And, then, when we’re ready to do the wall, we put the wall board up, a single layer, and then we come in with acoustic caulk, and we caulk all of our joints, and that keeps the caulk behind the finished layer, so it doesn’t, you know, squeeze out into where the painters going to be working also,” said Blaylock. “Yeah, then you’re doing a heavy bead then, correct?” asked Risinger. “We’re doing a heavy bean in there. We’re smearing it in there. We’re making sure it’s absolutely airtight, 100% sealed, no bubbles,” said Blaylock. “Nice. And, that’s also happening where the sheetrock hits the subfloor, too?” asked Risinger. “That’s correct. When we frame the interior wall, we set the base plate in a bed of that same sealant. Then we put the drywall in it, and just to make absolutely, double sure, we come, and we caulk it again,” said Blaylock. “That’s great. Love it. Once that green glue is installed, and we’ve got our double layers of 5/8 on there, how do we treat other penetrations? You know, we’re always going to have an outlet or a wall switch that we need to deal with. What’s the process for those?” asked Risinger. “Well, we need to make sure every box is putted up. That’s actually a clay pad that adheres to the back of a junction box and covers it – covers all the holes and actually adds some sound insulation to the metal box itself,” said Blaylock. We’ll conclude this blog by reiterating that soundproof recording studios really need help from professionals such as Matt Risinger, Bill Blaylock and us at Soundproof Studios. What happens when you leave even one small area of your room unaddressed? “Well, you know that air transfer is so important. Here’s a little illustration. Almost 20 years ago, I built a condo project that had concrete walls between two condo basements. And, we had a one-inch drilled hole in that concrete wall. And, with that one-inch hole, you could stand in one side and talk to somebody on the other side as if they were standing next door to you even though we had this massive concrete wall in between. It was because of that air transfer which means sound transfer. Bill, great job on this recording studio. I’m really looking forward to this getting finished up. Can you give us any final tips for somebody who’s watching this video?” asked Risinger. If a single hole allows sound to transfer between heavy-duty concrete rooms, you also need to invest in the industry’s finest soundproof studio doors and soundproof studio windows. Our design consultants have the experience and skill to help you sort out your best choices when designing your recording studio. There are options that you may not have considered that can greatly enhance your design. For example, our recording studio windows can be vertical or slanted. They can also be fixed or operable without hurting acoustics. Our sliding glass doors and telescoping sliding glass doors open up many new design possibilities and it is often that sound locks are no longer needed to achieve sound separation. We’ll help you explore the new world of design possibilities. Best of all, this valuable service is free. Contact us today to request a free consultation!